YOUR ASPHALT IS YOUR WELCOME MAT TO YOUR CUSTOMERS, CHURCH MEMBERS, FRIENDS AND FAMILY. PROTECT YOUR ASSET. NOT SEALCOATING COULD WIND UP COSTING YOU 10x MORE!!! 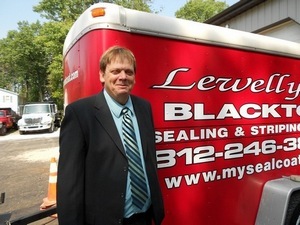 Lewellyn's Sealcoating, LLC, owned by Gary Lewellyn, started his black top sealcoating business part time in 1985 working evenings and weekends. In 1989, Gary's goal of making this sealcoating business a full time endeavor became a reality. The business has steadily grown over the years to include a fleet of trucks to meet the demands of residential, commercial and industrial customers. Gary takes great pride in customer satisfaction and realizes that word of mouth is the most effective marketing tool. Gary is involved in his business from the beginning to the end of every project. Lewellyn's Sealcoating, LLC performs work in the Kentuckiana area.